2014 is on the way out, 2015 not yet arrived. My sons and I spent yesterday with my side of our family at our yearly New Hampshire post-Christmas gathering. In one way, there was nothing new about this year’s version of the decades old tradition. Most of the same characters showed up, with three absences due to work or other engagements. The menu was a mix of past favorites (chowder, chili, veggie sticks, and wine) and one or two new items (bread bowls and icebox cake). In another way, everything had changed. Last year, MacKenzie hadn’t been born yet, Kristen and Jay weren’t married, and my brother was still living in Arizona. The children have grown in ways seen and unseen, and the adults have changed in ways hidden and obvious. Life continues along its course, but everyone involved lives it in uniquely blessed ways. The same is true for countless other families coming together in countless other places; what has been done is what will be done. But a new year is coming just as surely as an old year is leaving. Giving thanks for what has been, living into what is, and entrusting God with what will be – old and new, endings and beginnings. Letting go of the past to embrace the present and future – that’s my working definition of faith, December 28, 2014. Nothing new under the sun, and all things new every minute of every day. A shining star, a stable forlorn, the hope of all the world was born. Offered on Christmas, 2014, by Margaret Hill, artist, pray-er, singer, child of God. 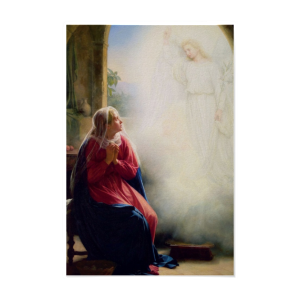 There is a rich selection of scripture readings for this day, but how can one not choose the Annunciation even if the chronology is truncated? At least I couldn’t. This enduring and endearing story is at the heart of the Nativity for many of us, I imagine. Growing up in a “progressive” Protestant church environment (yes, even in Tennessee many moons ago there was such a thing) one didn’t much deal with the virgin birth (or one explored the hermeneutics to determine if Isaiah was properly translated regarding such an event and debates ensued as to its relevance – yada, yada, yada). How we loved the sound of our intellectual bloviations. These days I’m not as smart as I used to be. 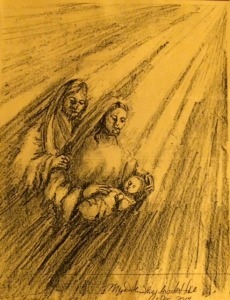 These days I just welcome the Christ Child, Messiah, Yeshua, into my heart as Mary did so long ago – no questions asked, no explanations necessary – and even with God’s grace occasionally mutter “let it be with me according to your word.” Not only is this story enduring and endearing — it is life-changing. Offered on December 24, 2014, by Bill Albritton, prayer ministry leader, ponderer, child of God. “Make a joyful noise to God, all the earth” the psalmist exhorts – not just to you and me but ALL the EARTH. The other psalm appointed for this morning proclaims, “Let the peoples praise you, O God; let all the peoples praise you.” Not to be outdone, the psalm for evening worship (117, the shortest psalm in the psalter and the shortest chapter in the Bible) shouts: “Praise the Lord, all you nations! Extol him, all you peoples! For great is his steadfast love toward us, and the faithfulness of the LORD endures forever. Praise the LORD!” That’s it – that’s the whole psalm: it reminds me to keep this short! These hymns of praise join with Isaiah’s prophecy of the return of the remnant from the Diaspora and the dawning of the messianic age, along with that great vision given to John of Patmos in Revelation of the new Jerusalem where all things are made new, every tear wiped away and where death will be no more. All come together to stir and gladden the heart as we near Christmas day. But wait. There’s more. What is this about the angel Gabriel proclaiming “joy and gladness” through the birth of another to be named John (Hebrew Yohanan, “God is gracious”) who will make all the earth ready for the Messiah? This John, who “even before his birth…will be filled with the Holy Spirit,” is to become John the Baptizer, the forerunner, the harbinger, the herald, the robin and witch hazel of the Spring of Life. Good news is in the air, indeed. Offered on December 23, 2014, by Bill Albritton, teacher, motivational guide, singer of psalms, child of God. What we write on our hearts, we live. When we learn something by heart, it is part of the fabric of who we are as much as it is something we know. Our names, the alphabet, Jesus Loves Me, our eye color, The Lord’s Prayer – all written on our hearts. Our faults, our fears, and our falsehoods are also written there. These, too, form us. We should take care when we write something on our hearts because the words are living in us and we are living the words. Part of being human is being born incomplete. Who we are comes from our unique souls and bodies, but it also comes from those who love us, raise us, and foster our growth. 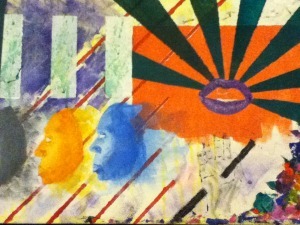 Our identities are our own, but they are intertwined with the hearts and souls of others. We should take great care when we write something on the hearts of others – the words are living in them and they are living the words. If we write love, love grows; if we write hatred, hate grows. Take up the pen with humility and courage, prayer and faith. What is the story we write? Do the words lead to the Word of God, the baby born in Bethlehem? There are some verses missing between Luke’s account of the Annunciation and the Magnificat, Mary’s song of praise. In between, she goes to see her cousin Elizabeth, who sees Mary for what she is and will forever be: blessed woman, the mother of Jesus. Elizabeth’s last line before Mary’s song is this: And blessed is she who believed that there would be a fulfillment of what was spoken to her by the Lord. Mary is blessed because she said yes. She said yes because she believed God would make her life holy – not just for her own sake, but for the sake of the whole world. She certainly didn’t say yes because any of it made sense. And her yes comes out in her song: Surely, from now on all generations will call me blessed; for the Mighty One has done great things for me, and holy is his name. Mary’s life has changed all of our lives. God asked and Mary said yes. Of all the times, places, and people, this one young woman said yes. I wonder sometimes if God asked others. Were there some who said no? What holy life is God offering each of us? Offered on December 21, 2014.
and make your throne firm through all generations. Offered on December 20, 2014, by Colin Fredrickson, artist, high school junior, child of God. When was the last time you saw someone dancing in flesh and blood real life? David danced before the Lord and all the people, leaping to high heaven right in the middle of the road. That must have been a sight – the king doing a two-step because words just wouldn’t do. Only children, saints, and fools have the courage for such dancing in public – what would the neighbors think it we pirouetted across the lawn when God’s grace came upon us? David’s dancing embarrassed his wife Michal; she saw only the shameless grandstanding of a man who married her for political gain. That’s no surprise: How could she see grace and joy when her whole life had been given over to the political ambitions of another? The jade green eyes of cynicism cannot recognize joy. Advent is a time to take a new look at the past. Our eternal creator makes room for holiness in the infant Jesus. The entire universe stops to see this moment, so mysterious and unexpected. Of all the fantastic things, of all the possibilities this world contains, the joy of this birth should get us all on our feet. If you have dancing shoes, dust them off; if you don’t, your bare feet will do. Don’t worry what the others see and think. God is coming in Jesus and the world will never be the same again. Amen! Offered on December 19, 2014. Why would the one who sustains all things, through whom all worlds are created, come into our world as an infant? Why come into the world as the child of a poor carpenter and a teenage mother? Offered on December 18, 2014. It didn’t look like what I thought it would – the space capsule. It was small and plain and nothing I’d want to spend time in. It looked like a good kick would end it. From a distance, through my television, it was amazing; up close in person, it was just a collection of nuts and bolts. Why do I expect the miraculous to be overwhelmingly awesome? Super size and high volume don’t guarantee anything other than a long shadow and temporary hearing loss. So why do I expect God’s messenger to be a rock star, crowd pleaser, larger-than-life superman? John wasn’t powerful among the religious leaders, he didn’t wear expensive clothes or dine at the finest restaurants, he had no army and no money. He just gave witness to God’s presence in this world and saw in Jesus God-With-Us. That’s more than enough: that’s a miracle. Would I recognize John if I passed him on the street? Offered on December 17, 2014.